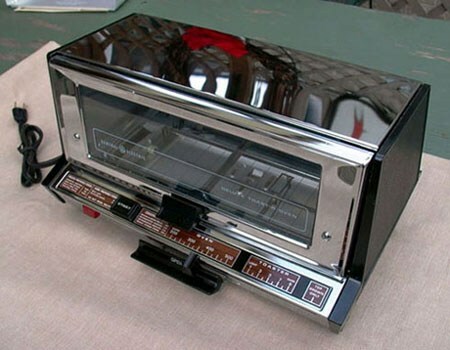 There are various places online, ranging from eBay to Toaster Central where one can buy vintage small kitchen appliances from the 1920s through the 1960s. We've already heard a bit on some other topics about the superiority of old Sunbeam waffle irons. I was wondering if there are any other old appliances that are better than their contemporary counterparts. And I was wondering why. First, aesthetics. Some of the appliances from 50 years ago are so beautiful they're almost art objects. This doesn't necessarily affect performance, but it's an advantage. 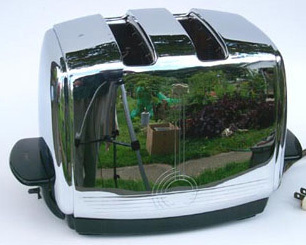 Few manufacturers today are bothering to bring this kind of artistry to small appliance design, though there are exceptions like some of the Michael Graves-designed items available at Target. Second, construction. As with cars and most everything else, older appliances are really heavy. They have thick metal housings and hardware. This has got to be good. Third, safety features. Or, rather, lack thereof. I imagine there was no concern, back in the day, about putting massive heating elements into appliances with little insulation, or anything like that. So, lots of raw power is probably available. So, what are some of the great applliances of yore, and why? 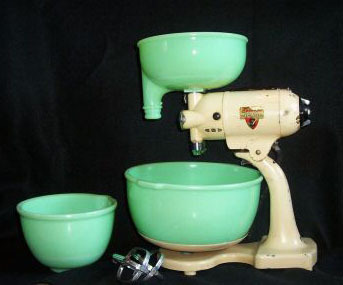 Many people prefer the old KitchenAid mixers, which had stronger motors and all metal gearing. My SEB Minichop Electric Chopper is 21 years old, and great for chopping small amounts of things such as basil, parsley, and garlic. In 1986 it cost S24.99 at the Deptford New Jersey Wanamakers Dept. Store. It takes up very little space, and is easy to clean. The thing that's so befuddling is that, in a rational world, every manufactured product would improve over time or, at worst, stay the same. It's just amazing that things can get worse. Older products should be curiosities. They shouldn't actually make better waffles. But they do. Crazy. And yet this is the way of many, but certainly not all, manufactured items. Clothes come to mind. The construction of suits from the 20s and 30s is much better than what you will get today, because they were meant to be owned and repaired over many years, rather than tossed when they went out of fashion or frayed slightly. Shaving is another thing - I've not used any modern cartridge razor that even touch the closeness and smoothness (i.e. lack of irritation) of a double-edged safety razor designed over 100 years ago. I think it's just a question of manufacturers realising that they can cheapen products, make them work less well, and people will still buy them. It's certainly better business to sell items that are cheaper and won't last as long, as long as people don't associate their failing with poor craftsmanship. And, apparently, most people don't. “There is hardly anything in the world that some man cannot make a little worse and sell a little cheaper"
The thing that's so befuddling is that, in a rational world, every manufactured product would improve over time or, at worst, stay the same. The companies want to make more profits. That means two things: spending less money on materials/construction and driving repeat sales via planned obsolesence. If you look at the Sunbeam waffle iron, for example, that thing is built like a tank. My parents have one that has been in weekly use for over 50 years, and it's still going strong. It makes 4 waffles at a time. It has heavy, deep, thick plates for making waffles and completely separate plates for making pancakes or use as a sandwich press. There's just no way any modern company is going to put that kind of craftsmanship and materials into a waffle iron unless they plan to sell it for over 100 bucks (average for a waffle iron seems to be around 30 bucks, with a top price of maybe $70). If you look at the Sunbeam waffle iron, for example, that thing is built like a tank. What do you think was the price back when new, in real dollars of today or expressed in labour time? Yes, that would be an interesting computation. I wonder if a top-of-the-line waffle baker purchased in 1950 cost the equivalent in today's dollars of what the KitchenAid Pro-Line waffle baker or Waring WW150 costs today (around $300 each), or even a high-volume restaurant model like the Wells WB-2 (around $750). I also wonder how those compare to the old Sunbeams -- it would be pretty funny if even the $750 model sucked by comparison. It should be pointed out thast these are all commercial-style Belgian waffle bakers, which is another thing entirely. I'm pretty sure the Wells WB-2 is a regular waffle maker. In any event, there are regular waffle makers out there that conform to commercial specs and cost hundreds of dollars, e.g. this one from BigTray. I just wonder if they're any good. The Sunbeam Oskar Food Processor - it's like having a third hand. I have three and continue to pick them up on ebay since they are discontinued. IMO, the best of its type and size every made - does everything and then some. Yea, I wonder if they're good as well. My experience is that, to my taste, modern waffle makers produce a waffle with pockets that aren't deep enough, and as a result the waffle isn't as fluffy and light as it could be. Then again, I grew up with the old Sunbeam, so that's what seems "right" to me for a standard (i.e., not Belgian-style) waffle. I'm sure the Sumbeam couldn't keep up with the commercial units in terms of volume, but on a single waffle-to-single waffle comparison, I wouldn't be shocked if the Sunbeam came out on top. Electric skillets. My mother gave me her Sunbeam electric skillet when I went off to college in 1975 - she received it as a wedding shower gift in 1957. I still use it. I have a "few" vintage appliances. 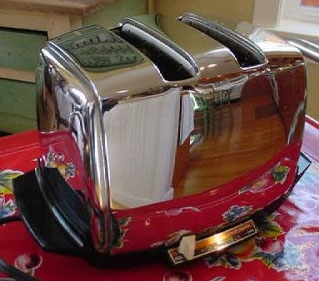 The Sunbeam T-20, toaster, with the slots crossways and that lowered the bread automatically and when done, allowed it to gently rise, was a standard from its introduction in the 1940s until the early 90s. Sunbeam, which began as the Chicago Flexible Shaft company (they made sheep-shearing equipment), produced what has been labeled as "The mixer America grew up with"
And "The most famous appliance of the 20th century"
Certainly Sunbeam outspent every other small appliance manufacturer from the mid-1930s through the 1960s. 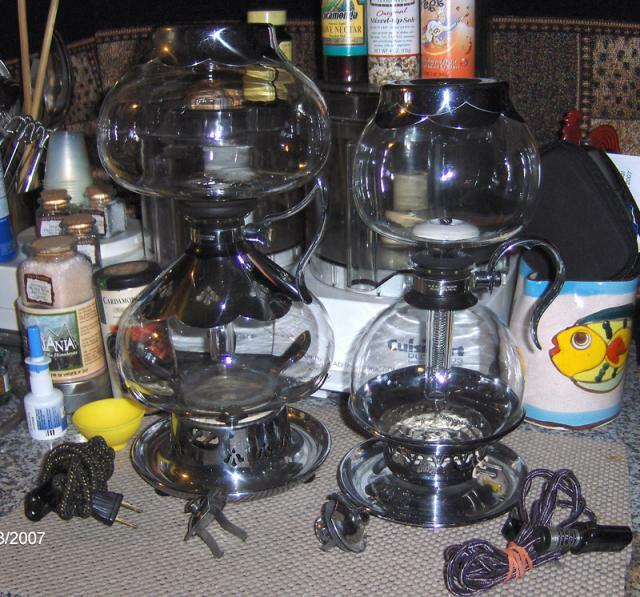 The Sunbeam Coffeemaster - an automatic vacuum coffee maker was the "gold-standard" and they still work very well. 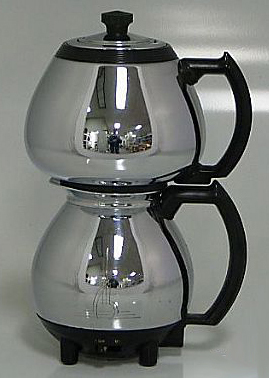 The automatic Silex vacuum coffee makers, the Farberware Coffee Robot - a classic vacuum pot were just about as popular but, more fragile. Here are some photos of some of the appliances I consider "classics" and the best of their kind. In my first post I didn't mention the best toaster oven ever - the GE Automatic - which, while smaller than most, pops open automatically when the toasting or baking is done. When GE sold its small appliance division to Black & Decker it was discontinued. Too bad! Sunbeam classics - note the Art Deco design which was on many Sunbeam appliances in addition to the Coffeemaster and the T-20 toaster. and 45 years later, the T-50. 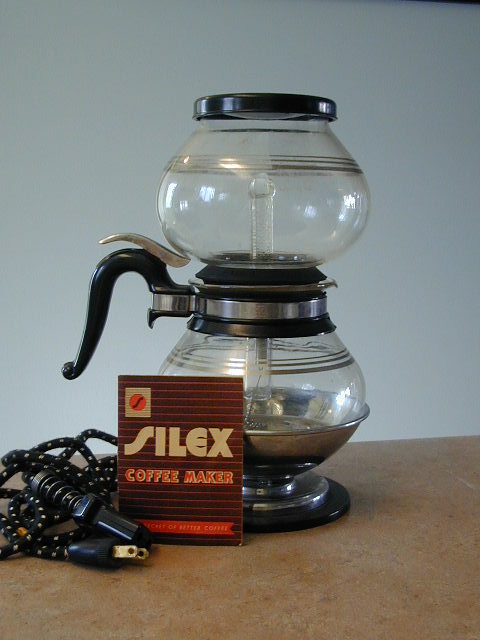 Silex vacuum coffee makers ranged in size from 2 cup to 12 cup. The two in this photo are 12 and 6. So what you all are telling me is that I need to go find my mother's turqoise mixmaster that she got as a wedding present in1960 and borrow it permanently even though it isn't in good working condition. The beaters don't stay up and every few minutes, you have to shove them back up into the mixer. My mother also has a waffle iron that was probably a wedding present where the cord is fraying. We took is over to my sister-in-law's house last christmas to make waffles. My mother guarded it to make sure my clean freak sister-in-law didn't throw it away because it looks so beat up. But the waffles are fantastic. Note to self: claim the waffle iron as well. I like my mother's mixmaster much much better than the Kitchenaid mixer I was given the mid 1990s. I have an antique Hobart Meat Slicer I bought at auction years ago. It weighs about 60-70 lbs, can be completely disassembled for cleaning and had can slice a frozen loin of strips or rib eyes like paper. Not exactly small but fit on the counter when used. It was my best purchase ever. Roger every bit of that: click. Meanwhile, am I the only owner of a vintage Rival Ice-O-Matic ice crusher? This machine is so far superior to the lousy machine in my new refrigerator it's scary. eanwhile, am I the only owner of a vintage Rival Ice-O-Matic ice crusher? I've got a couple of 'em. They rawk. does anyone remember what happened to cuisinart? they made one very simple, very reliable, very perfect appliance. and then once everybody who was going to buy one did, they nearly went broke. And I buy every single one of them I see in thrift stores and second hand places and find new homes for them. They never stop working. In fact just picked one up yesterday. One of the members of WACEM a Yahoo group - (We Actually Collect Electric Mixers), cleans, refurbishes and repaints mixers, expecially Mixmasters. His name is Jim Dayton. There are a few other small appliance/mixer specialists around the country and all of them are swamped with work because so many people are collecting them now.